Leaving the entrance passage or hallway we enter the Workhouse kitchen. Two great cooking pots are situated in the left-hand corners. These were firmly set in a stone brick and mortar construction. Underneath each pot was a cavity or grate to hold a fire. The pots were used for boiling potatoes or stirabout for the inmates. There were two fireplaces a few feet apart near the centre of the left-hand wall. I remember, says Mrs. Mary Anne Darcy, Bawnboy, seeing some of the inmates cooking in the Workhouse kitchen. I also saw them sitting on long forms in the dining hall, eating their meals. There was a big double-bench up the centre of the dining hall floor and they sat on that and ate their meal. Usually when we went there it would be Mass time on a Sunday, and there would not be any inmates on view. The people of Bawnboy area went to Mass in the Workhouse chapel for years before the Workhouse was closed in 1921. On Sundays we might be in the chapel before the inmates came in to attend Mass. They entered the chapel through two doors, one to the right and the other to the left of the altar. The altar was on a raised portion of the chapel floor and the inmates occupied the part of the chapel nearest the altar. The men always came in on the right-hand door, the women on the left, as viewed from the body of the chapel. The centre aisle of the chapel was flagged or tiled with nine-inch square tiles. If you went to Mass there you knelt on the wooden floor behind a form and you sat on the same form at intervals, during announcements or a sermon. If you were a minute or two late, and who wouldn't be at some time or another, you'd see many Mass-goers taking up their positions in the dining hall, some standing inside one or other of the doors, some kneeling or in a favourite pose by some of the men, with one knee on his cap and the other one for resting his elbow. One particular man didn't come any nearer to the altar than the kitchen, and if you saw him there on your way in, you knew you were late. He was said to be the last to arrive and the first to leave. A mild diversion which took strangers by surprise occurred on Holydays. This was when the local postman sought out members of the congregation to deliver their letters, but most of this activity took place in the dining hall and out of sight of the altar. I remember, says Mrs. Darcy. Some of the Workhouse personnel, women like Miss Marian Keane, Matron, and Mrs. Ellen Byrnes, Nurse, who stayed on as tenants in the Workhouse after it was closed as an institution. Other tenants came to live there too. There were plenty of extra rooms for tenants at that time - not many now. I remember a pair of lassies that used to come out to work with my aunt in Corrasmongan. They were Sally Weir and Maggie Maher. These two girls went to Bawnboy National School before the Workhouse closed in 1921. Sally Weir's mother was an inmate of the Workhouse, but she loved to get out for a day to my aunt's place in Corrasmongan, to work at the hay. Sally married John Tighe and reared a fine family. She was a kind and friendly woman. In the 1920s there were Irish Language classes in every town and village - people realising that they were Irish and should speak their own language. In Ballyconnell Messrs McGrath, Miley, and McKevitt taught the Irish classes. McGrath was shot dead in Ballyconnell during the 'troubles'. McKevitt taught for a while in Bawnboy. I had a class of my own in The Porter's Room in the Workhouse. They came from all around to my class, the Reilly girls, Maggie and Marie, Tirnawannagh; Anna Rose and Kathleen Plunkett, Muinaghan; Patrick McDermott, Moherloob; Jim (Philip) McGovern, Gortmore; Hubie Maguire, Gortullaghan; Pee McKiernan, Mullaghlea; The McGoverns of Tonlegee; Helen McElroy, Bawnboy - and that's not the half of them. There were children from the primary school there, teenagers and adults, including teachers. There was a book of lessons for each student which contained stories, poems and items of topical interest. Each lesson was read, explained and discussed. Questions were asked on the subject matter and writing exercises based on the reading lessons were done. Points of grammar would have to be explained and oral repetition to encourage speaking the language properly. Irish songs were taught and sung at the end of each class. After a few years the primary school pupils became more competent in the use of the Irish Language and felt they did not need extra tuition, so that gradually the Irish classes were discontinued. Mrs. Darcy learned the Irish Language in her own home, where her grandfather was a fluent Irish speaker. At that time there was an Irish College in Glangevlin where Mrs. Darcy, a native of the place perfected her Irish. She was awarded certificates of proficiency in the language by the College, and scholarships to attend Summer Courses in the Connemara Gaeltacht. 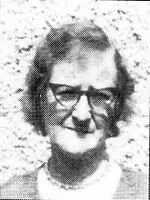 Here she acquired the 'blas' of the Connemara Irish speakers and this she imparted to her students. Permission to republish this article here has been given by Mary Ann Darcy's son Aidan Darcy.